– Modern Nomads, Vagabonds or Cosmopolitans? The „Sahara Connected“ project concentrated on a special economic niche of transnational mobility of Tuareg and generated a classification and analysis of the development of a border crossing strategy between Niger, Algeria, and Libya. 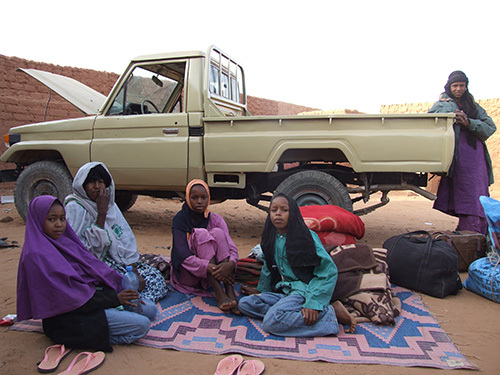 Political marginalization, economic exploitation and ecological crisis in the Sahara and the Sahel posed the life of the originally pastoral Tuareg nomads into a rather challenging situation. 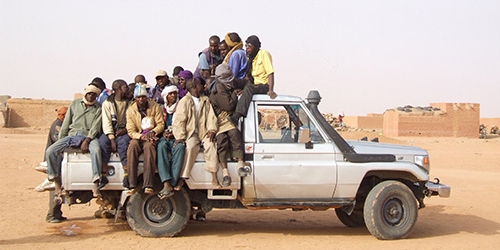 A large part of the Tuareg therefore is increasingly forced to switch to urban lifestyles, or is pushed into making transnational border crossings in order to gain new life strategies. In the last decade the Tuareg have developed a space of agency between Libya, Algeria, Niger and Mali. The Tuareg organize transportation, they provide the transport facilities, and deliver passengers and goods through the Sahara. This illegal transnational border-business is called afrod. Afrod is a strategy where the boundaries between legal and illegal are merged, and the distinction between trade, smuggling and migration is blurred. The Tuareg´s know-how of the desert, tribal and kin cross-border relations, and sophisticated use of multiple identities allow them to engage in transportation through the Sahara. Beginning in the 1960s, first with camels, then with Land Rovers and, since the 1980s, with Toyotas, the Tuareg provide transport for passengers across the Sahara and smuggle staple food (milk powder, macaroni, tomato paste, oil, sugar, etc.) and cheap fuel. This triggered the development of a transportation structure that now serves sub-Saharan migrants and refuges in crossing the Sahara, the ‘second face of the Mediterranean’, in order to reach finally Europe. In the framework of the project contemporary challenges and transformations in the Tuareg´s transnational border business have been examined, such as changing routes, new protagonists (Tebu), and new goods (such as alcohol, drugs, live stock, cars). Main focus was on changing perceptions of afrod by the local Tuareg population themselves. In the beginning afrod was considered as a notable and prosperous business providing proude, prestige and economic wealth, and characterizing its protagonist as powerful elite. In recent years the high reputation of afrod went down due to the changing political and security circumstances. The the civil war in Libya, the Tuareg-rebellion in Mali, the overall insecurity due to Islamist groups, an increasing weapon and drug trafficking through the Sahara and rivalries between protagonists working in border crossings contributed to a negative image of afrod. Although the conditions for afrod have undergone major changes and modifications, the business will go on, since it is a strategy to escape poverty and unemployment. Afrod can be seen as a strategy of coping with waithood, a prolonged period of suspension between childhood and adulthood where young adults must improvise livelihoods and conduct their personal relations outside of dominant economic and familial frameworks, and often find solutions in illicit strategies or second economies. The trans-Sahara and trans-Sahel connections date back more than two thousand years. Already in Ancient Greek there has been a trade route from Egypt leading west through the Fezzan in Libya, the Ahaggar mountains in Algeria, ending near Timbuktu2. Camel caravans dominated the transport over centuries, and established a space of transit and connectivity which has been characterized by the movements of people, goods, and ideas up to recent days3. The Tuareg have been experts in mobility, transnationality and in establishing an overall connectivity between Maghreb, Sahara and Sahel for centuries. The trans-Saharan trade of salt, slaves, gold, and agricultural products served the Tuareg and the Berber beginning with the arrival of the camel in North Africa (around the first century BCE) as a pillar of their economy4. With European colonialism the Trans-Saharan links experienced disruption. Colonial rail and motorized road transport dealt the final blow to a Trans-Saharan trade that has lost its global significance before the late 1800s5. The original territory of the Tuareg has been split into 5 nation states: Libya, Algeria, Niger, Mali, Burkina Faso). Their radius of moving has been limited and restricted. The territorial cut in combination with the ecological disorder through droughts and famine, and local and supra-local attempts to enforce political hegemony has turned the life of the Tuareg in into a rather challenging position. Since decolonization process North and West Africa has experienced its final split. The radius of moving of the Tuareg thus has been limited. Their territory experienced a downfall of cohesion and through new territorial borders they became a periphery in terms of global flows, contact and linkages. While on the one hand complex interconnections with economic and cultural flows6 characterize the globe today, we are faced on the other hand with more fortified and strengthened territorial borders7. Borders, however, are not only cutting and separating traces of disjuncture and empty transitional zones, more often they are sites of creative cultural production and investigation8. While state borders increasingly become complicated in crossing legally in the Sahara and the Sahel9, clandestine movements10 for migrants as well as for the local population likewise gained weight. In recent decades the Tuareg have discovered an economic niche where they combine their transnational mobility with clandestine demands. It was in the 1960s when the term afrod came into being, and was derived from the French word “la fraude” (English: fraud), and borrowed into Tamasheq11. The development of an illicit border business responded to main crisis of the Tuareg: The decline of pastoralism, the territorial cut in the context of independence, and the ecological disorder released by droughts and famine12. Last but not least a ban on caravans which began in 1963 in Algeria contributed to the development of illegal strategies in order to circumvent national orders which aimed to keep a closer watch on the Saharan region and break or weaken the links between the Tuareg of the North, who had become Algerians, and those of the South, now attached to Sahelian countries13. Young Tuareg started to leave their nomadic surroundings in Niger (and also in Mali) to search for work and a more prosperous life. Quickly they have been equipped with the name ishumar14, a term deriving from the French “chômage” (unemployment). These young unemployed people, the ishumar, sought to develop a trading business which often almost resembled smuggling and fraud15. They had modest funds at their disposal, relied on old donkeys and exhausted dromedaries, but nevertheless started to cross the borders first to Algeria, and later on to Libya, but also to Nigeria and other North- and West African countries. Algeria and Libya became the most prosperous direction of ishumar. The young ex-nomads have been among the first inventing afrod as a strategy to overcome the critical economic situation of these days. Camels, life stock and food (like semolina, sugar, tea, macaroni, and milk powder, called lahda) were among the first and most smuggled goods between Libya, Algeria and Niger16. The heyday of afrod is to locate between the first and the second Tuareg rebellion17. From the end of the 1990s until 2007 afrod was one of the most prosperous business´ of the Tuareg next to desert tourism18. This period represented a quite steady time for the Tuareg and the countries involved in their business. The so called Toyota Station, a Toyota Land Cruiser pickup truck, setting forth on the journey across the Sahara fully laden with up to 32 passengers or barrels of fuel, was characteristic for the border traffic of these times. The Tuareg organized transport, they provided the cars and crossed the Sahara as drivers and guides on several routes from Niger and Mali to Algeria and Libya. From South to North they led Sub-Saharan migrants on their way to Libya, and when coming back, their cars were loaded with cheap fuel from Algeria, milk powder (lahda), dates, macaroni, soft drinks and goods hardly or only very expensively available in the South (like construction material). The Aïr Mountain in Northern Niger profited well from the afrod business. Without the smuggled fuel, staples and goods the Tuareg nomads could have not been able to set up a lively garden cultivation, which is a further strategy to escape impoverishment. For the impoverished Tuareg nomads it was a quite easy way to reach the well established states of Libya and Algeria. Traveling officially in contrast would have meant to rely on passports and official border posts, visa restrictions and customs duty, most nomads could not afford. The enormous profit during these days however has been achieved with transporting migrants. Sub-Saharan passengers had been highly available since Libya was constantly in need of cheap manpower. The risk of getting caught by national security forces was estimable, therefore many Tuareg tried to engage in afrod, no matter in which shabby condition their cars had been. Young boys entered the business as apprentice, cooked for the drivers, made tea on the road and had been responsible for changing the tires. What originally has developed as a small scale trading route and a transportation service for the Tuareg themselves, has became one of the main pillars for the migration of Sub-Saharans through the Sahara. Not only Tuareg have been working in the clandestine business. It was and still is an income for most of the ethnic groups living in the Sahara and its fringes. 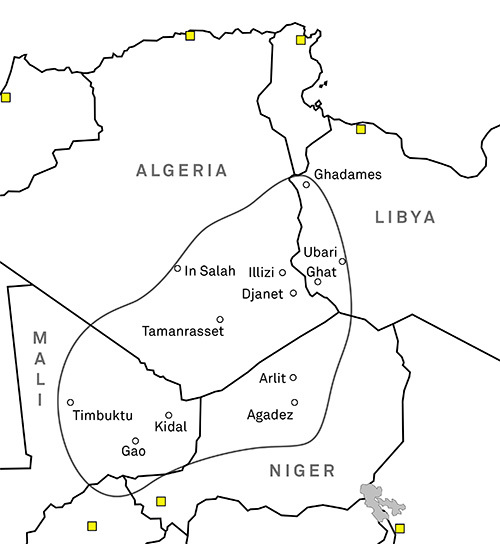 Arabs, Hausa and Tebu are well represented, but most of them deal as broker who look for passengers, or provide the goods at the start- and ending points, while the Tuareg sort of monopolized the Northern route from Arlit (Niger) to Djanet or Tamanrasset (Algeria), and further on to Ghat or Ubari (Libya). This itinerary operates as a synonym for afrod, and thus automatically means being organized by the Tuareg. Afrod does not categorically and exclusively mean to work as an active smuggler, but rather refers to the special form of situational mobility of the Tuareg in general: of men, women and even children (Photo: Ines Kohl 2012). One point I shall emphasize is, that afrod does not categorically and exclusively mean to work as an active smuggler (of goods or migrants), but rather refers to the special form of situational mobility of the Tuareg in general: of men, women and even children. Afrod means crossing the borders without ID-cards or passports. 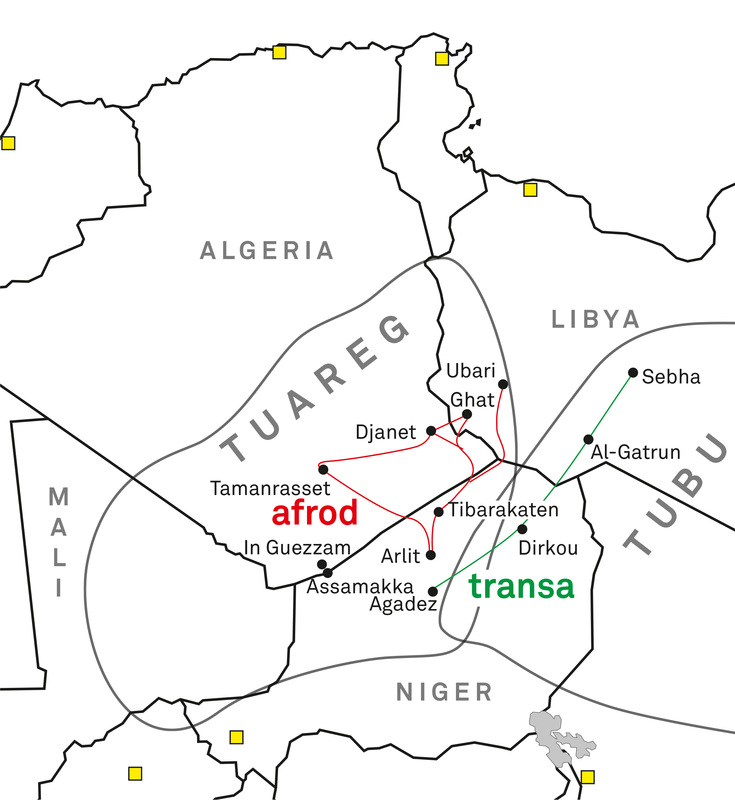 Afrod is the connecting link between the Tuareg living in Niger, Mali, Algeria and Libya. It has become a significant economic niche of the Tuareg where they could apply their nomadic skills and know-how. In doing so they invented certain strategies like the use of kinship affiliation and inter-ethnic loyalties and the benefit of multiple identities, as I elaborated elsewhere19. Summary: What is afrod, what does it mean? Since its emergence, the Tuareg´s border business has changed a lot and experienced a modification of the meaning. Afrod meanwhile does not categorically and exclusively mean to be an active smuggler, but rather refers to a special form of situational mobility of the Tuareg, who move either without passports or identity cards or with the use of multiple identities within the borderlands of Niger, Mali, Algeria and Libya20. The additional dimension of situational mobility afrod gained in the beginning of the 1980s. Triggered by recurring droughts and famine the majority of nomads in Niger and Mali lost their base of living and searched refuge in the prosperous neighboring countries of Libya and Algeria. Illegal border crossings increased during the first Tuareg rebellion in the 1990s in Niger when whole families fled from military repressions21 and afrod changed from a small scale trade and smuggling business into rather a transportation service for the Tuareg to escape the rebellion in Niger. Afrod does not mean to work exclusively as a smuggler. It rather designates a specific form of the Tuareg´s mobility: It means moving freely between the Saharan states of men, women and children. Nowadays families are kept together by using afrod in order to visit transnational kin. Afrod always means crossing the Sahara with 4-wheel-drives. The so called Toyota Station, a pickup, has become the synonym for it. With Toyotas staple food is smuggled from Algeria and Libya to Niger, and the Tuareg are dependent on cheap fuel from Algeria in order to cultivate their gardens in the Aïr mountain. Afrod is a way of granting support. Afrod also means carrying Sub-Saharan migrants to Algeria and Libya. The Tuareg provide the transport. 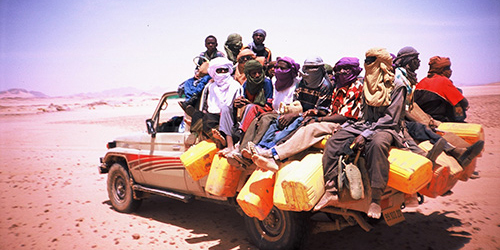 While on the Northern and Southern hubs other ethnic groups like the Arabs and the Hausa are connected with finding passengers, Tuareg only operate as agents in crossing the Sahara. Afrod means a respective route through the Sahara. The main hub is Arlit, the Uranium mining village. From here 4 wheel drives turn to Djanet or Tamanrasset (Algeria) or directly to Ghat (Libya). Afrod is the opposite of transa, which is another transport system in Niger. It is the route from Agadez via Dirkou to Libya with huge trucks. This is a different system, mostly operated by Arabs or Tebu, but the Tuareg have never hardly crossed their way. Afrod is the route from Agadez/Arlit (Niger), via Tamanrasset/Djanet (Algeria) to Ghat/Ubari (Libya) and is almost exclusively run by Tuareg with Toyota pickups. Between 28 and 32 passengers are transported in each vehicle, which take 3 days to cross the 1,000 kilometre route in a convoy of several cars. Transa is the truck route from Agadez via Dirkou (Niger) to Gatrun/Sebha (Libya) and is the main route for Sub-Saharan migrants. Between 100 and 120 passengers are transported on each truck, passing through the Sahara in 1–2 weeks. It is a half-official route through military check points at which transit duty is paid, even though the passengers have no passports or valid visas. Transa is organized by Arabs, Hausa and Tebu. Very few Tuareg work in this system. From March to December 2013, more than 40,000 migrants are estimated to have been transported by transa, as reported by the Italian NGO Reseau Exodus/Bambini nel Deserto – but the real figure may be more than double, as the data derives from governmental controls on one check point and many drivers do not register. According to the Altai Consulting report in 2014, 45,298 people officially arrived in Europe via the ‘Central Mediterranean’ route in 2013 (increasing to 170,664 people in 2014), which includes the Niger-Libya connection. The Libyan war and its aftermath, the Tuareg rebellion and overall political crisis in Mali, and the raising threat of Islamist terror networks which are grouped around drug and weapon trafficking, resulted in an overall increasing insecurity in the Sahara and the Sahel, and the conditions for afrod underwent major challenges and changes: New itineraries, new protagonist, and new goods characterize today´s afrod. For a detailed description of the major changes and challenges, please refer to the publications. In the aftermath of the Libyan war the Tebu experienced an empowerment in Libya. 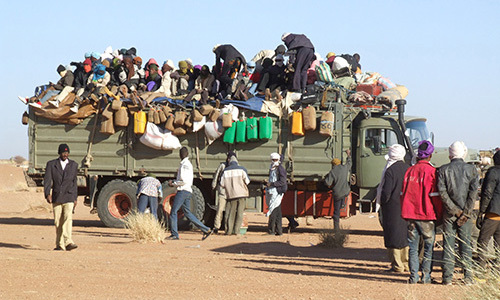 They additionally have achieved monetary power and set up a quick connection for passengers with brand new pick up cars from Agadez directly to Madama, and further on to Gatrun and Sebha. (Photo: Ines Kohl 2012). See Kohl, Ines 2013: Vagabonds or Elites? The mobile lifestyle of contemporary Tuareg, in: Two Homelands, Nr. 38, 73–86. Ibid. 2010: Modern Nomads, Vagabonds, or Cosmopolitans? Reflections on Contemporary Tuareg Society, in: Journal of Anthropological Research, University of New Mexico, Volume 66 , Number 4, Winter 2010, p. 449–470. R. A. Austen, Trans-Saharan Africa in World History, Oxford, New York, Oxford University Press, 2010, p. 1–2. L. Marfaing, S. Wippel « Espace transsaharien: Espace en movement. Quelques rèflexions pour une approche conceptuelle – Une introduction », in L. Marfaing, S. Wippel, Les relations transsahariennes à l´epoque contemporaine: Une espace en constant mutation, Paris, Karthala 2004, p. 7–26. R. A. Austen, Trans-Saharan Africa…, op.cit., p.1. J. Scheele and J. McDougal, Saharan Frontiers. Space and Mobility in Northwest Africa, Indianapolis, Bloomington, Indiana University Press, 2012. See R. A. Austen, Trans-Saharan Africa … op.cit., p. 16f. A. Appadurai, « Disjuncture and Difference in the Global Cultural Economy », in: M. Featherstone (ed. ), Global Culture: Nationalism, globalization and modernity, London, Sage, 1995, p. 295–310. A. Fischer and I. Kohl, « Tuareg Moving Global … », art.cit., p. 1. R. Rosaldo, Culture and Truth: The Remaking of Social Analyses, Boston, Beacon Press, 1989. H. Donnan, T. M. Wilson, Borders: Frontiers of Identity, Nation and State, Oxford, New York, Berg 1999, p. 1ff. See for example J. Brachet, Migrations transsahariennes. Vers un désert cosmopolite and morcelé (Niger). Bellecombe-en-Bauges, Terra, éditions du croquant, p. 166f., where he describes the problems of crossing Saharan borders legally. Clandestine movements elude registration and statistical coverage, which means somebody enters a country without an entry visa and identification. Illegal defines “overstayer”, people whose entry visa or residence permit has expired, nevertheless they stay in the respective country. See Trends in International Migration, Annual report 1999, Organisation for Economic Co-operation and Development (OECD). A. Bourgeot, Les Societies Touarégues …, op.cit., p. 432ff. A. Aher, « L’initiation d’un Ashamur », art.cit., p. 141., H. Claudot-Hawad, « A Nomadic … art.cit., p. 671. See A. Bourgeot, Les Societies Touarégues …, op.cit., p. 432f. H. Claudot-Hawad, A Nomadic Fight …art.cit., p. 665. Sing. masc. ashamur, sing. fem. tashamurt, plural fem. tishumar, pl. masc. ishumar. A. Aher, « L’initiation … », art.cit., p. 141–152. For the economic exchange see E. Grègoire, Touaregs du Niger …, op.cit., p. 157–213 (Les échanges avec l´Algerie, les échanges avec la Libye). The neglect of the needs and demands of nomads after independence, together with a social economic marginalization by the elites ruling their land, had major impacts on the Tuareg, when in the 1980s enduring droughts finally destroyed the economic wealth of the pastoral nomads. The lack of governmental support was the main reason why Tuareg instigated in rebellions. In Niger, the first rebellion lasted from 1990 to 1998 and ended with a peace deal. Since very few of the concessions made by the government were implemented (like integration of the ex-rebels into security forces, social and economic improvement of their region), the Tuareg launched a second rebellion from 2007 to 2009. The rebels once again demanded political participation, decentralization and social improvement of their shattered life circumstances. They additionally called for a fair distribution of the huge income of the uranium mining in their settlement area. For political analyses and summaries of the two rebellions in Niger see f.e. F. Deycard, Les rebellions Touaregs du Niger: Combattants, Mobilisations et Culture Politique. Thèse pour le Doctorat en Science politique, Université de Bordeaux, 2011. E. Gregoire, Touaregs du Niger … op. cit. J. Keenan, « Resisting Imperialism: Tuareg Threaten US, Chinese and Other Foreign Interests », in: A. Fischer and I. Kohl (ed.) Tuareg Society within a Globalized World: Saharan Life in Transition. London, New York: I. B. Tauris Academic Studies, 2010, p. 209–230. G. Klute, Die Rebellionen der Tuareg in Mali und Niger, Habilitation thesis, University of Siegen, 2001. G. Klute, « Modern Chariots in Small Wars in the Sahara », in: R. Mursic and J. Repic (eds.) Places of Encounter: In memoriam Borut Brumen, Ljubljana:Univerza Ljubljana, 2007, p. 185–189. B. Lecocq, « Unemployed Intellectuals in the Sahara: The Teshumara Nationalist Movement and the Revolutions in Tuareg Society », in: IRSH 49, Supplement, 2004, pp. 87–109. For the touristic development of the Tuareg see f. e. M. Scholze, Moderne Nomaden und fliegende Händler: Tuareg und Tourismus in Niger, Münster, LIT, 2009. I. Kohl, « The Lure of the Sahara: Implications of Libya´s Desert-Tourism », in: The Journal of Libyan Studies, volume 3, number 2, Oxford, 2002, p. 56–69. I. Kohl, « Saharan „Borderline“-Strategies … », art.cit., p. 100–103. The strategy of inventing multiple identities I have elaborated in I. Kohl, Beautiful Modern Nomads. Bordercrossing Tuareg between Niger, Algeria and Libya, Berlin: Reimer 2009, p. 29. Cp. J. Scheele, Smugglers and Saints of the Sahara. Regional Connectivity in the Twentieth Century, Cambridge: University Press, 2012, p. 97 (footnote 3). During the first rebellion in Niger the Nigerien Army assaulted and massacred civilians, as indicated by my informants and NGO´s, like the Society for Threatened People / Gesellschaft für bedrohte Völker GfbV, or Amnesty International. See also I. Ag Maha, Touareg du XXIe siècle. Grandvaux, 2006.